I can’t take credit for being the first to find this chic checked blouse. That goes to Glasgow Instagrammer @carolinesstylehacks. Love her feed! So I knew as soon as she posted it, I had to go on the hunt. I’m a sucker for a good checked pattern (as you might remember from this, this and this post). But fun, flirty details like a ruffled collar, placket and cuffs sealed the deal. For this look, I’ve paired it with a favorite pair of lightweight wool pants, but I’ve also worn it with jeans — black, grey and blue. And as soon as the weather really warms up, I’ll be wearing this checked blouse with a denim skirt or white jeans. 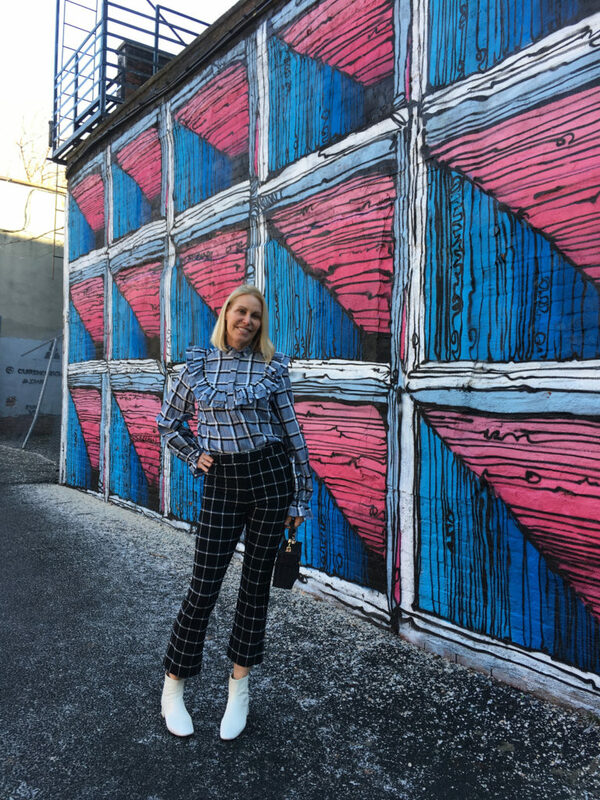 I took these pants for a “test drive” via Rent The Runway, the online shop that lets you choose from thousands of designer gowns, dresses, separates, handbags, jewelry and more. Their motto of “Why buy when you can rent?” makes a lot of sense, especially if you are worshipping at the Marie Kondo altar or just trying to stay on budget. And if you do fall in love with something, as I did with these checked pants, you can buy at a fraction (literally!) of the retail price. As well-tailored as these pants are, they are also super-comfortable thanks to their stretch wool blend. Again, I’ve lost count how many times I’ve worn them, because they are so stinkin’ versatile. Dress them up with a black cashmere sweater and heels, dress them down with sneakers and a sweatshirt. They also make an excellent travel option. For accessories, I kept it simple. 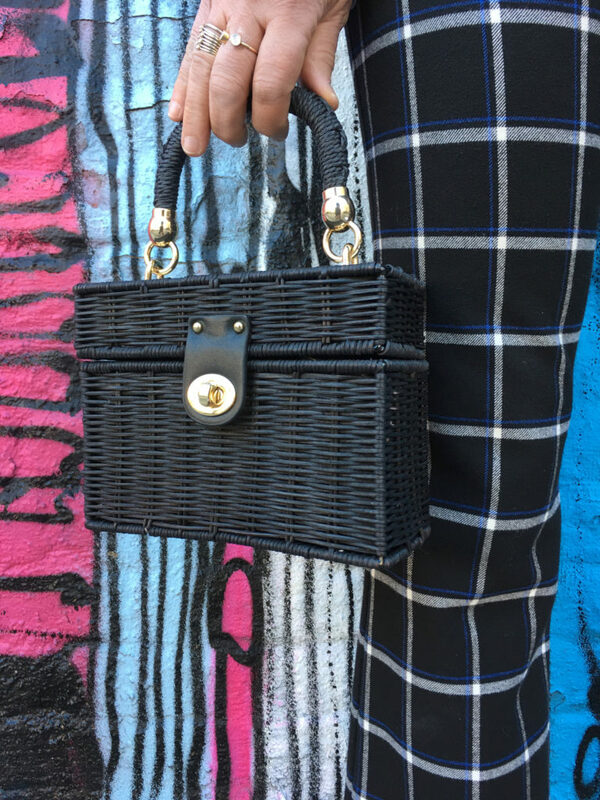 My favorite white boots (as seen here, here and here) and mini-yet-mighty rattan bag (also seen here). Both straddle the seasons like superstars — the boots see me through Fall/Winter/Spring, and I’m happy to tote this bag all year long. Last but not least, let’s talk about this charcoal corduroy trucker jacket — another season-spanning option when it comes to outerwear. And while it’s menswear-inspired (and actually snagged in the men’s department! ), this jacket is polished enough to layer over everything from this look to a floral dress to a tee and jeans. Love its cozy faux shearling collar too. Pants: (3.1 x Rent the Runway, no longer available. BTW, you can try out RTR right now for $80 off a 60-day Unlimited Trial with code SOSMART). I’m thinking of trying these joggers out, but also really like these and these (on sale!). Bag: (Zara, sold out but love this super cute, super affordable version!) As well as this and this. Jacket: (Zara Man, sold out) Similar here (comes in petite/regular/tall and at a great price) and here (on sale!). Grid lock ! Great idea. Love you’re styling LAS! Thanks so much, KMG. That wall was a find! This outfit is killer!! I love every single part. I’m so sad that the bag is sold out but I’m going to check out your other options. Love the mural for your backdrop too! Glad you liked my take on Grid Lock, Jenifer. I actually spotted the bag in-store the other day, so you may get lucky!